Richmond "Richie" Laryea (born January 7, 1995) is a Canadian soccer player who currently plays for Toronto FC in Major League Soccer. Prior to his college career, Laryea played for Sigma FC Academy and Dante Alighieri Academy in Toronto. Laryea played college soccer at the University of Akron for two seasons, reaching the College Cup semi-finals in 2015. Laryea was named to the All-Mid-American Conference Second Team in 2014, and was named to the All-Mid-American Conference First Team in 2015. Following his sophomore season, Laryea signed a contract with Generation Adidas. Laryea was drafted in the first round (7th overall) of the 2016 MLS SuperDraft by Orlando City. He was loaned to Orlando City B in March 2016. After spending the first half of his second season once again on loan to OCB playing as both an attacking and defensive midfielder, Laryea made his MLS debut on 25 June 2017, subbing on for Kaká in a 4-0 defeat to Chicago Fire. Laryea got his first MLS assist on September 27, 2017, assisting on Yoshimar Yotún's goal against New England Revolution. He made his first career MLS start on the final day of the season away to Philadelphia Union. On November 27, 2018, the club announced they had declined his contract option. On March 21, 2019, Laryea signed for MLS side Toronto FC. In May 2016, Laryea was called to Canada's U23 national team for a pair of friendlies against Guyana and Grenada. Laryea scored in the opening match against Guyana. Laryea is of Ghanaian descent. His younger brother Reggie Laryea also played soccer for Akron. ^ "Sigma FC's Richmond Laryea Signs Generation Adidas Contract with MLS". Sigma FC. Retrieved April 20, 2016. ^ "Akron Zips will take on Stanford on Friday in College Cup 2015 (photos)". Cleveland.com. December 6, 2015. Retrieved January 15, 2016. ^ "Men's Soccer garners a conference-best seven All-MAC selections". Akron Athletics. ^ "Zips Garner a League-Best Eight All-MAC Selections". Akron Athletics. ^ "MLS announces 2016 Generation adidas class, signs Stanford senior defender Brandon Vincent". MLSsoccer.com. January 9, 2016. Retrieved January 15, 2016. 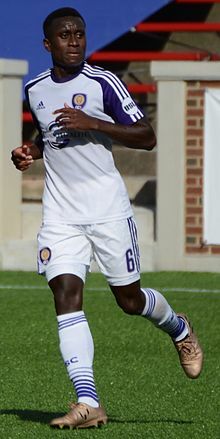 ^ "Orlando City selects Akron's Richie Laryea with No. 7 pick in MLS SuperDraft". Orlando Sentinel. Retrieved January 15, 2016. ^ "Orlando City SC Loan Seven Players to OCB". Orlando City Soccer Club. ^ Austin David (May 16, 2017). "Richie Laryea Starting To Prove Himself in Year 2 for Orlando City B". The Mane Land. ^ Alicia del Gallo (July 19, 2017). "Richie Laryea excels with Orlando City after stern talk with coach". Orlando Sentinel. ^ "A Game of Firsts: Orlando's Dominant Win Provides Accolades". September 28, 2017. ^ "Orlando City Falls at Philadelphia in Season Finale". October 22, 2017. ^ "Orlando City declines options for eight players after tough 2018 season | Pro Soccer USA". www.prosoccerusa.com. Retrieved November 28, 2018. ^ "Toronto FC signs Richie Laryea". www.torontofc.ca. Retrieved March 21, 2019. ^ "10 Things About Richie Laryea: His love for Toronto, his mom, and, yes, Drake". MLSsoccer.com. ^ "Reggie Laryea - 2017 Akron Men's Soccer Roster - Akron Athletics". gozips.com. ^ "Richie Laryea profile". Soccerway. Retrieved October 28, 2017.